In this latest installment from PokerStars, we see who has the better poker face, Usain Bolt or Kevin Hart. Who do you think can keep a straight face the longest? Cristiano Ronaldo might not be a PokerStars SportStar anymore, but it’s not holding him back as he has 9 out of the top 10 most “liked” Instagram posts in 2017 to his name. Soccer star Neymar Jr who was also a PokerStars SportStar Pro sneaks into the list at number 4. In episode 3 of the Facebook series “Amazing Science Adventures with Liv Boeree,” the poker pro teams up with 7-time World Snooker Champion Stephen Hendry to explore the science behind the game of snooker. The Romanian leg of the Unibet Open concluded with Marius Pertea winning the €1,100 Unibet Open Bucharest Main Event for €90,925. 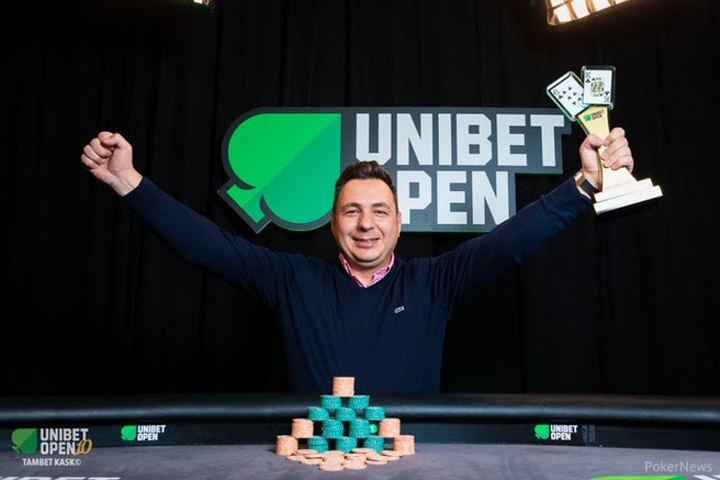 Pertea is the third Romanian to win a Unibet Open Main Event title in ten seasons and keeps the title at home for another year after fellow Romanian Traian Bostan brought the trophy back to Romania by winning last year. Pertea clawed his way into the the final two where he eventually beat Robert Vokuvic from Croatia—who earned his way into the Main Event through Unibet’s loyalty program—heads-up to win the event. Unibet have always worked hard to ensure that their tournaments are played in some of Europe’s most spectacular venues and this one was no different. Players from around Europe gathered at the JW Marriott’s Grand Ballroom to claim a share of the nearly €500,000 prize pool and show themselves to be one of the best poker players in Europe. Representing the 10-year anniversary of the tour, 502 players entered the historic event with the top 71 players making it to the money including Dutch player Tom Vogelsang, two-time Unibet Open champion Dan Murariu, Unibet Ambassador Dara O’Kearney and eSports star Kevin “Papaplatte” Teller. The €2,200 High Roller event field this year was made up of 155 entries who all provided a very high level of competition. Although a lot of the hometown hopes were pinned on Dan Murariu who took home the title in a No limit Hold’em event at the 2017 Wynn Classic in Las Vegas less than two months ago, Dutchman Olvedo Heinze won the event by defeating heads-up against Katsuhiro Muto of Japan—who recently came in fifth in the PokerStars Festival in Lille, France and won the DeepStack turbo Hold’em event at the Asian Poker Tour championships in Manila. The competition was livestreamed on by Unibet and gave the audience a great chance to see some top players in action. If you feel inspired why not check out this free bet and see if you might one day be able to play in the Unibet Open. All the Unibet Opens have a number of different categories below the high rollers that are open for the public to enter. The first Unibet Open was in 2007 and was hosted in Warsaw. Since then, it has expanded across Europe and has grown both in number of entries and the prize pool. Previous host cities have included Madrid, Milan, Budapest, London and even Cannes. The Unibet Open has become one of the most exciting live poker tours in Europe. The next stop is the Unibet UK Poker Tour Manchester which runs December 8-10 and has a £40,000 guarantee. The 2018 Unibet Open tour schedule is expected to be released soon.